Live with joy and ease? Find a healthy and balanced lifestyle? Connect with your essence and core values? Enhance your health and wellbeing? 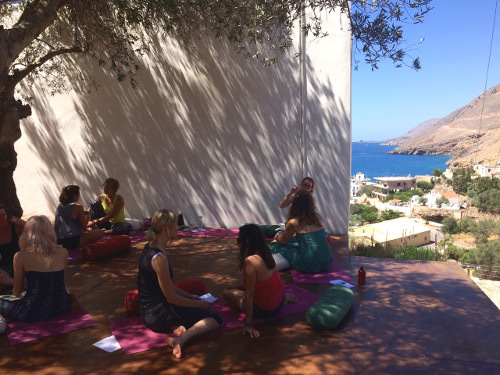 Join life coach and meditation and yoga practitioner Julie for a 7 day Yoga Lifestyle experience on Crete, the inspiring and heart-opening Mediterranean island paradise. Julie used to have a busy corporate job in London. Once she learned to live her days mindfully, she noticed how she became much more relaxed. The days weren’t less stressful, but she wasn’t as stressed anymore. Instead, she was feeling grateful for living effortlessly and in flow. She created this exclusive Yoga Lifestyle retreat to assist you in cultivating gratitude and discovering what mindful living means to you. The five themes of this life changing retreat are designed to help you reflect on and anchor your days in the things that matter most to you and commit to living that. Treat yourself to a break from every day life and learn how to flow with joy and ease. Come back feeling transformed, reborn, empowered and committed to a healthy and balanced lifestyle tailored to your rhythm and needs. Rekindle that deep connection with your inner being, and with fellow participants who will quickly become close friends. Julie facilitates the workshops through an energising mix of activities - from yoga, meditation and mindfulness visualisations to dance, life coaching, ceremonies and art. No previous experience in yoga is required for participation in the course! The week begins with a delicious vegan welcome dinner on Saturday the 12th of October in the evening at 8 pm. From Sunday to Friday we will start the day with a lovely relaxed movement and meditation practice. Then it’s time for a refreshing detox smoothie before we start the interactive morning workshop. After lunch and siesta we come back together for the afternoon workshop. 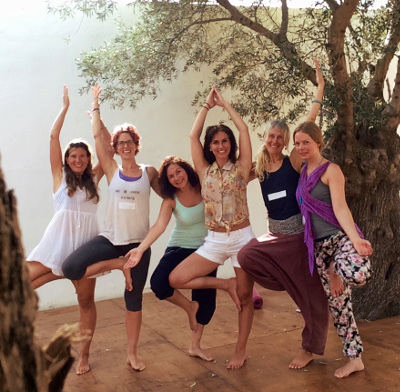 The retreat programme is designed to put these themes in practice straight away so you will experience the benefits of a Yoga Lifestyle first hand. We will explore what each theme means to us personally and how to commit to bringing them out more in our lives. We will learn tools to overcome self limiting beliefs that may stop us from doing so. Read more about Yoga Lifestyle in this article about ‘Making ordinary days extraordinary’. We will be out in nature as much as possible so we can enjoy our connection with the sea, the trees and the hills. In your free time, you can relax, enjoy the beach and sunshine, get a massage, explore the village, take a walk in the countryside. Individual excursions (e.g., hikes, boat trips) can also be arranged during the week at an extra cost. The number of guests is limited to 10 to create a warm and friendly atmosphere and to ensure that everyone gets a personalised experience. Six vegan breakfasts (smoothie) and 5 lunches are offered at the house, while in the evenings guests can dine out in the village restaurants (not included in the course cost; approx. €15 for a full meal including drinks). On Saturday the 19th of October we will have brunch together before guests leave. The welcome dinner on Saturday 12th of October is also included in the price. Coaching enables you to create real and positive change by dramatically increasing your levels of self-confidence and awareness. A life coach facilitates your journey of finding answers to your questions. The answers already lie within you and point you to how to realise your full potential. The life coaching method is built on the cornerstone that we are all naturally creative, resourceful and whole and that we all possess the capacity for knowing what is best for ourselves. In a coaching session, the coach creates for the client a safe place of authentic being, powerful listening and encouragement, to uncover the best in oneself and others. This way, the coach and client together create insights and commitment to action so that the client’s life is optimised. In 2012 Julie decided to make a drastic change and re-align her life to her values. She left her strategy consulting career in London to study yoga in India and become a certified co-active life coach. Her life purpose is to be the heart beat that attunes you to your inner frequency. Julie combines her extensive coaching, yoga, dance and business consulting experience to help clients find their calling and unique voice. She specialises in ikigai (life purpose) and feminine empowerment coaching. 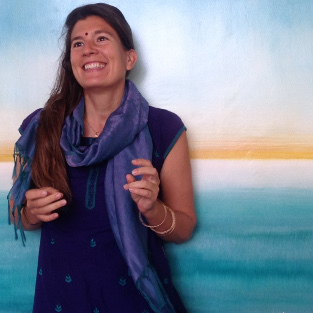 Having recently settled on Crete, she spent the last six years travelling and giving workshops and sessions across India and Europe, and going deep into spiritual practise in her spiritual home Auroville in South India. She is certified as a Unesco creative movement therapist, an Awakening Women’s Temple leader and is a Madretierra menstrual therapist in training. Julie coaches a wide variety of clients internationally, online and face to face. In addition to (online and live) 1:1 sessions, she facilitates retreats, workshops and coaching training as well as monthly online gatherings and women’s circles. Her own experience has given her a keen understanding of what it takes to switch careers successfully. Transitioning from academia to corporate life to starting her own coaching and dance therapy practice taught her the importance of loving what you do and being authentic. Julie loves her work which gives her the freedom to combine personal, professional and spiritual growth. A common theme in client feedback is that Julie´s style is natural, warm and impactful. It is a natural extension of what she enjoys doing – creating a safe space, creating clarity and transformation. She loves her dance, yoga, art and meditation practice, and is passionate about conscious femininity and spreading cyclical awareness which she shares about on her Facebook group and Instagram account New Moon Sisters. Find out more on www.maitreecoaching.com. “You have changed my life and given me the confidence to open up and live with joy and ease. You’re an amazing coach who opens people’s hearts. Thank you!" €840 double ensuite (single occupancy) - please note that single room availability is limited). €670 twin or double ensuite shared. €580 small twin non-ensuite room shared (ideal for friends).